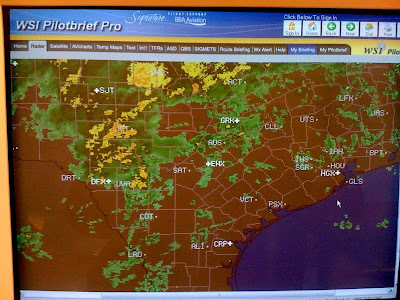 Yesterday, March 11th, my birthday, was rainy, cold, wet and cloudy. A great time to try my skills as a student instrument pilot! This was my first lesson (actually lesson number eight) where I was totally in the soup. 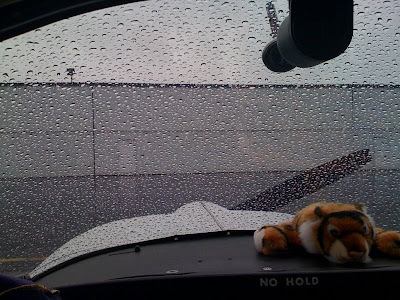 I flew 3 instrument approaches in IMC conditions down to near approach minimums. 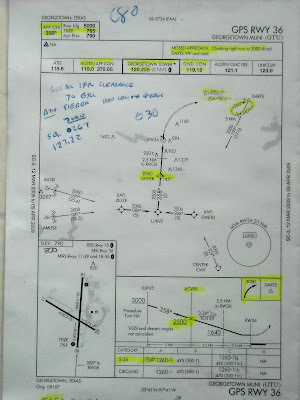 My first approach was the GPS 36 approach at Georgetown (KGTU). Shown below is the approach plate that I used. Highlighted areas are important information. We filed a "local IFR" flight plan in order to accomplish this flying session. Thirty minutes of terror followed by 30 seconds of exhilaration as the Georgtown airport finally appeared when I was about 500 feet above the ground. Flying in the clouds can give you the feeling of rapid disorientation. I had this feeling much stronger than any of my other instrument lessons because any tiny glimpse out from under the hood gives your brain enough data to keep going on deciding which way is up. Take away all visual cues added with the movement of the airplane and your brain is toast when trying to figure out which way is up. 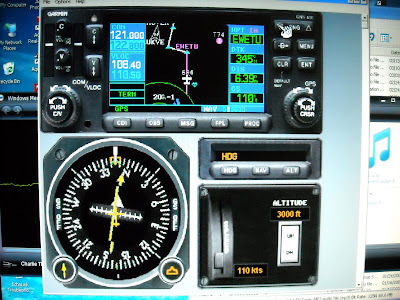 This was a very strong sensation and the solution is to simply trust your instruments and FLY THE AIRPLANE... while your brain is yelling at you...giving you bad advice. In closing I flew from Austin-Bergstrom to Georgetown to Taylor and back to Bergstrom. Shown below is a screen shot of my GPS track log. A little swervy but not bad considering I did not enjoy the luxury of using the auto-pilot. This is all hand-flown in the soup and blind as a bat with regards to looking out the window. The little loop is where we landed at Taylor and taxi'ed back for fuel. Some ride for my birthday eh? You flew actual IMC for the first time on Friday the 13th? :) Have you no sense of superstition? What were the ceilings like?